through new eyes. Trapped in a cycle of doubt and discovery, she wonders how you can stay true to who you are and fit in. What the hell is ‘normal’ anyway? This is the bittersweet story of a twenty-first-century family, and why being different isn’t a disability—it just takes some getting used to. Jo Case is senior writer/editor at The Wheeler Centre in Melbourne. She has been books editor of The Big Issue (Australia), deputy editor of Australian Book Review and associate editor of independent literary journal Kill Your Darlings. She worked for independent bookseller Readings Books Music and Film, producing their monthly newsletter, for seven years. Her reviews, essays and opinion pieces have appeared in the Age, the Australian, Sydney Morning Herald and the Monthly, and have been broadcast on ABC Radio National’s The Book Show and Triple R’s Breakfasters. She has also been published in Sleepers Almanac and Best Australian Stories. Jo was a founding board member of The Stella Prize, Australia’s only prize to reward the best book of the year by a woman writer, and was a member of the programming committee of the Melbourne Writers Festival for six years. Life for Jo is a juggling act: work as a freelance writer, joint custody of her son Leo (aka Boomer) and the demands of parenthood - made more challenging by the fact that Leo seemed to have trouble fitting in at school. Leo's an intelligent boy, but his social skills are sometimes lacking. He can talk easily and effortlessly about the things that interest him - such as Australian Rules football, Lego Bionicles or Yu-Gi-Oh - but settling into the classroom can be challenging. A teacher thinks that Leo might be gifted, and suggests testing. Sometime later an assessment was undertaken. Jo was expecting that Leo might be gifted; she wasn't expecting a diagnosis of Asperger's Syndrome. This memoir is about both Leo and Jo. While describing Leo, his actions, reactions and passions, Jo also writes of her own life - she may also have Asperger's Syndrome. Of the challenges faced as a teenager, as a young adult pursuing a career, as a sole (and then partnered) parent and of living with Asperger's Syndrome. It is difficult not to sympathise with Jo when she worries over the impact of the Asperger's label on Leo, and when trying to ensure that Leo's best interests are represented. At other times, Jo's reactions are confrontational and sometimes seem over the top. It's one of the strengths of this memoir that Jo includes both. At an Auskick session (an adaptation of Australian Rules football for children), Leo has problems with team play. Jo writes: `I want to leap over the fence and smack him; I want to fold him in my arms and comfort him; I want to weep with humiliation and defeat.' I think that many parents (and not just of Asperger's Syndrome children) can relate to this. I found this an interesting and challenging read. A young member of my extended family has been diagnosed with Asperger's Syndrome, and I have an interest in trying to understand better how it impacts on her perception of the world. 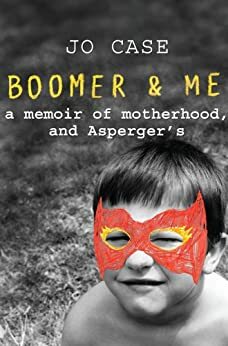 But it isn't just about Asperger's Syndrome: it's about families and parenting, about friendships and partnering, about working through issues and finding out what works (and what doesn't). When I read Jo Case's memoir, I was impressed, both with the story she told, and in her style of writing. It's an unusual memoir with its pared-back, unsentimental analysis. I didn't know much about Asperger's when I began reading it, and I still had a lot of questions when I finished; I think one of the strengths of the book is that Jo doesn't pretend to have all the answers. I enjoyed, and cringed alongside, her honest and often funny appraisal of what motherhood is meant to be about, as she feels her way through it. I liked this author. I felt I got to know her through the book. She's a great Mum and a nice individual. Hats off to parents who have to do it tough with non mainstream children. this is well written, with a great insight for the reader into Asbergers. it's a good modern family tale with lots to think about afterwards. and, maybe we are all a little Asbergers at times. It was a heart felt story that I could relate to her feelings of frustration and elation as she went through the many test for her son and herself before she was able to accept and have others accept the diagnosis. I couldn't stop reading it, (and I hate reading!). I felt like I could have written some parts of it myself. Thanks for your honest account of your life and feelings, I think they'll have great meaning to a lot of people, as they have to me. Great book!